Liquid fuels derived from plant biomass are one of the best alternatives if an inexpensive means of commercial production can be found. Major research efforts are focusing on fatty acids, which are the energy-rich molecules in living cells that have been dubbed nature's petroleum. There are many different approaches to alternative fuels being worked on today. Yet, none seem to be in the forefront. We have fuel cells, batteries, ethanol, methanol, and natural gas. Now, U.S. Department of Energy’s Joint BioEnergy Institute is working with microbes to produce an advanced biofuel directly from biomass. Utilizing synthetic biology, the JBEI researchers engineered a strain of Escherichia coli (E. coli) bacteria to produce biodiesel fuel and other important chemicals derived from fatty acids. The microbes can produce a diesel fuel directly from biomass with no additional chemical modifications. The cost of recovering biodiesel fuels are nowhere near the cost required to distill ethanol, which is widely used today. E. coli has the natural ability to synthesize fatty acids and is amenable to genetic manipulation making it an ideal target for biofuels research. The combination of E. coli with new biochemical reactions, realized through synthetic biology, produces structurally tailored fatty esters (biodiesel) from simple sugars. Liquid fuels derived from plant biomass are one of the best alternatives if an inexpensive means of commercial production can be found. Major research efforts are focusing on fatty acids, which are the energy-rich molecules in living cells that have been dubbed nature’s petroleum. 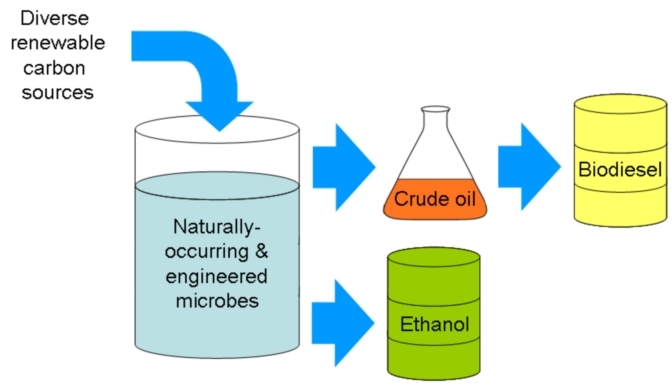 For over a century, fuels and chemicals have been produced from the fatty acids in plant and animal oils, which serve as the raw materials for biodiesel fuel. Fatty acids bound to a carrier protein are produced by the biosynthesis of microbial fatty acids. This accumulation inhibits the making of additional fatty acids. E. coli doesn’t waste energy making excess fat. By removing fatty acids from their carrier proteins, scientists are able to unlock the natural regulation and make a large quantity of fatty acids that can be changed into numerous products. 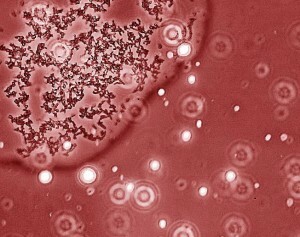 After successfully diverting fatty acid metabolism toward the production of fuels and other chemicals from glucose, researchers engineered a new strain of E. coli to produce hemicellulases, which are enzymes that are able to ferment hemicellulose, the complex sugars that are a major constituent of cellulosic biomass and a prime repository for the energy locked within plant cell walls. By engineering E. coli to produce hemicellulases, microbes are able to produce fuels directly from the biomass of plants that are not used as food for humans or feed for animals. By giving the E. coli the capacity to ferment both cellulose and hemicellulose without the addition of expensive enzymes, we can improve the economics of cellulosic biofuels. This is important, as we would not take away from the production of food to develop fuels, which would drive up the cost of food or result in shortages. Wood is our largest biomass energy resource. But many other sources of biomass can now be used, including plants, as well as residues from agriculture or forestry, and the organic component of municipal and industrial wastes. Even the fumes from landfills can be used as a biomass energy source. Biomass generates about the same amount of carbon dioxide as does fossil fuels, except that carbon dioxide is actually removed from the atmosphere by new plant growth. The net emission of carbon dioxide will be zero as long as the plants continue to be replenished for biomass energy purposes. These energy crops, such as fast-growing trees and grasses, are called biomass feedstocks. Feedstocks can also help increase profits for the agricultural industry. Biofuels are classified into two major categories. The first fuel is called first generation biofuel and is derived from sources such as sugarcane and corn starch. The sugars from these sources are fermented to produce bioethenol, an alcohol fuel, which can be used directly in a fuel cell to produce electricity or serve as an additive to gasoline. 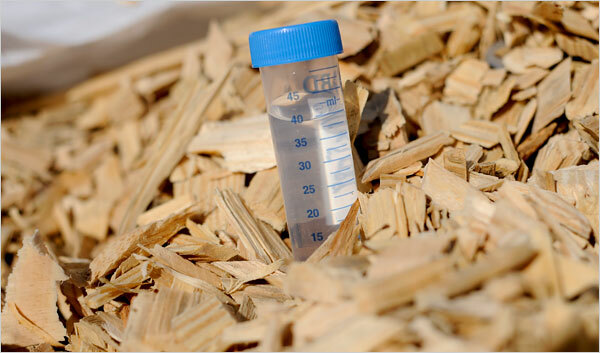 The second generation of biofuels utilizes non-food based biomass sources such as agriculture and municipal waste. It mostly consists of lignocellulosic biomass, which is not edible and is a low value waste for many industries. Despite being the favored alternative, economical production of second generation biofuel is not yet achieved due to technological issues. There is a great deal of research involving algal, or algae-derived biomass due to the fact that it’s a non-food resource and can be produced at rates 5 to 10 times those of other types of land-based agriculture, such as corn and soy. Once harvested, it can be fermented to produce biofuels such as ethanol, butanol, methane, biodiesel and hydrogen. Efforts are being made to identify which species of algae are most suitable for energy production. Flexible-fuel vehicles (FFV) are vehicles that can run on blends of up to 85% ethanol (E85) and straight gasoline. Therefore consumers can refill their tanks with gasoline if ethanol is not available. More than 80% of all new cars sold in Brazil are FFVs capable of using 100% ethanol. 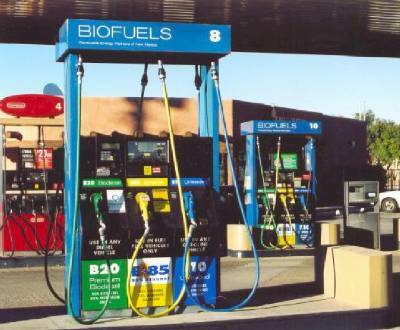 You can find biofuel refueling stations on the Internet at http://www.biodiesel.org/using-biodiesel/finding-biodiesel/retail-locations/retail-map, but their scarcity remains a major obstacle to use of the fuel. Working hard to develop advanced biofuels might allow the U.S. to produce the equal amount of oil, which we currently import from the Persian Gulf by 2050. During this time, if we make our vehicles more efficient and make plug-in hybrids widely available, biofuels could do away with our requirement for gasoline. The goal is to have all future vehicles equipped for both gasoline and biofuels. Along the same line, alternative aviation fuels are being tested and approved for use in both commercial and military aircraft. The future for biofuels looks promising, but will biofuels be the frontrunner in alternative fuels? This is a race that we are just going to have to watch.